Look at this thing. What stories it could tell. The salty sea dog of all the seagulls. A face like the crazy homeless guy that told you he knew the day you would die. And an egomaniac too. 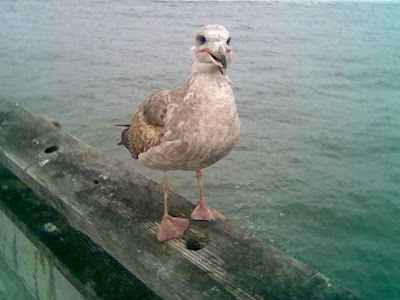 I had already taken two cam phone shots of this and started walking back down the Venice pier and he flew back into my path and posed for this shot, which was by far the best one. And I think he knew it was going to be.